The path your data takes from legacy mainframe and other aging applications to a consolidated, secure, and future-proof InfoArchive platform is blocked by hurdles. 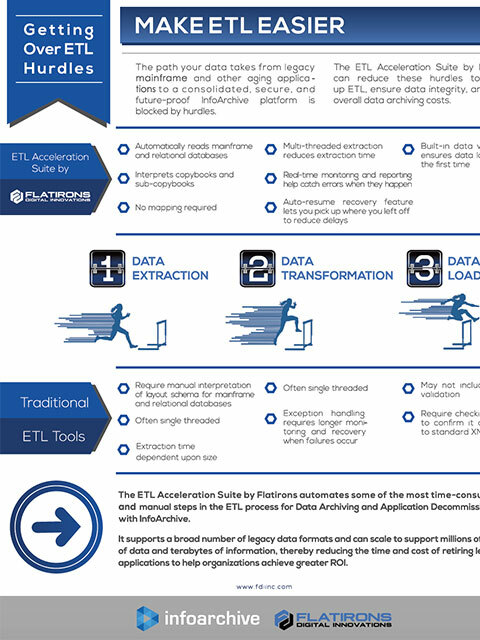 The ETL Acceleration Suite by Flatirons can reduce these hurdles to speed up ETL, ensure data integrity, and lower overall data archiving costs. The ETL Acceleration Suite automates some of the most time-consuming and manual steps in the ETL process for Data Archiving and Application Decommissioning with InfoArchive. It supports a broad number of legacy data formats and can scale to support millions of rows of data and terabytes of information, thereby reducing the time and cost of retiring legacy applications to help organizations achieve greater ROI.